Bouncers. Merchandise. Excitable women. 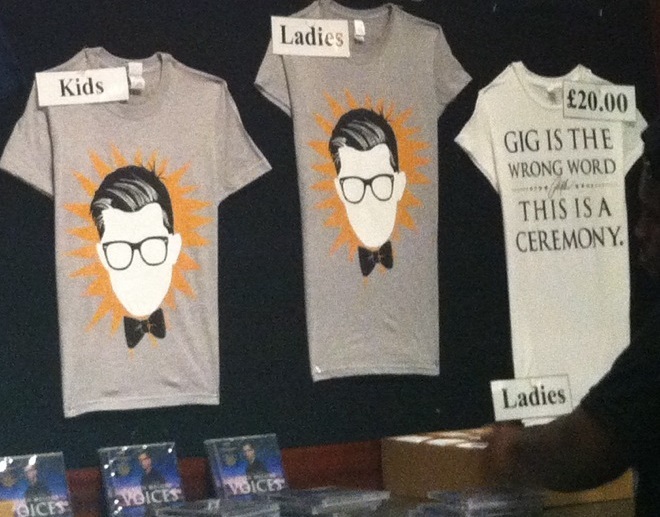 The opening night of choirmaster Gareth Malone’s UK tour had all the trappings (if not the ambience) of a pop concert, right down to the T-shirts on sale in the foyer of the Hammersmith Apollo. If that boy ever gets laser eye surgery, he’s in trouble from a merchandise perspective. Last night’s concert was the first of a 14-date UK tour to promote Malone’s new choir and their album, Gareth Malone’s Voices, released on Decca last November. The programme promised to combine tracks from the album with new material and Malone-fan favourites including the Military Wives’ 2011 hit, Wherever You Are. The first night of a tour is never without technical issues, and the choir was somewhat underamplified in the concert’s opening number. But they soon got up to speed. Highlights from the first half included a great arrangement of Fleetwood Mac’s You Can Go Your Own Way and an unexpected yet perfectly serviceable performance of Justorum Animae by Renaissance composer William Byrd – a salient reminder of Malone’s background in classical choral music. The choir were amplified throughout – necessary, given the scale of the tour venues, but purists may be irritated by the ample use of reverb*. Some of the technical effects were fun, though – particularly the beatbox loop which was put to good use in Lord’s Royals and Malone’s party piece for audience and choir, Stand By Me. Audience participation proved key to the evening’s success, and it was here that Malone’s skills as a showman came to the fore. Not for nothing is he billed as ‘the nation’s favourite choirmaster’. Admittedly, this critic’s cathedral choir-trained hackles rose when the audience was first called on to join in, but Malone’s charm and enthusiasm were genuinely infectious. Before long I was singing along with the rest of the audience to Sting’s Fields of Gold, though not quite dancing in the aisles. The second half opened with a really excellent turn from the Citibank choir, who featured on Malone’s Sing While You Work series (Voices will be joined by a different community choir on each night of the UK tour). The highlight of this half was an arrangement of Keane’s Hamburg Song, set with lush, Eric Whitacre-like harmonies. This was followed by a similarly Whitacre-like number by Paul Mealor (him off of the Royal Wedding) which gave the choir the opportunity to prove their ‘straight’ singing chops. Overall, the quality of choral singing was high, with a particularly luminescent first soprano section who managed to float the top notes pleasantly without sounding shrill. There were also a number of outstanding solos from within the choir. Voices are an attractive and of course a very young bunch of singers (a Hi-de-Hi! joke from Malone went down far better with the audience – average age 45 – than with the choir – average age 21). Though they handled the more classical rep ably, the choir seemed much more comfortable (and perhaps better rehearsed?) with the pop, right down to the ubiquitous ‘vocal gymnastics whilst pawing at the air’ moves that most of them had down pat. Yet their communication with conductor and audience was impressive: proof that when a choir comes out from behind the score, both sound and performance tend to be incomparably better. While there were a few technical distractions – persistent feedback, soloists fiddling with earpieces and some frankly bizarre lighting choices – the evening overall was jolly good fun. Malone & Co. clearly have what it takes for a successful pop tour – hummable tunes, the opportunity for a singalong, and impressive compèring from an exceedingly likeable showman. Four stars. This entry was posted in Review and tagged concert, Gareth Malone, Gareth Malone's Voices, Hammersmith Apollo, Paul Mealor, review, tour, Voices. Bookmark the permalink.